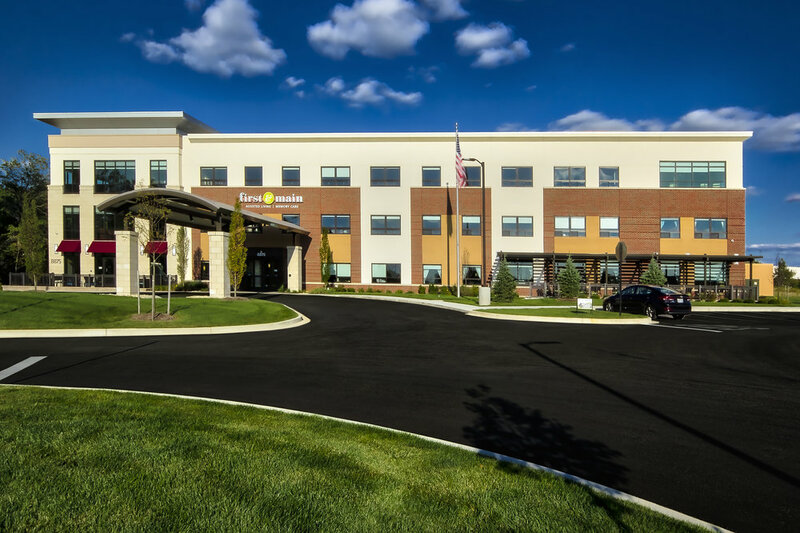 The First & Main Senior Living Communities had its beginning at Metro Health Village in Wyoming, Michigan and has now expanded to other sites in Southeast Michigan and suburbs of Columbus, Ohio. Each site currently has a higher-end senior living complex with approximately 100 units in a mix of assisted living and memory care. The approximately 102,000-square-foot facilities are comprised of three levels and feature internal secured courtyards for the residents. The first floors include lobby, dining, movie theater, chapel, bistro, salon, community room, and assisted living units. The second floors are devoted to assisted living and the third floors are designated for memory care, each with their respective dining rooms and amenities. The original prototype from Metro Health Village continues to be the standard-bearer for the First & Main brand. Sites such as New Albany, Ohio and Commerce, Michigan have provided alternate building enclosure designs to suit the needs of the communities. The complex is master planned for a future connected independent living building and detached duplex villas, where property is available.